Fleetwood’s FA Cup win at Hereford boosted confidence, clinched a dream tie with Jamie Vardy’s Leicester and bolstered Town’s finances ahead of next month’s transfer window. Head coach Uwe Rosler has stressed the need for recruitment and hopes the televised third-round tie on January 6 will help. Rosler said: “It is live on telly, it’s Jamie Vardy’s comeback and we will have a full house. That will probably make things a little bit easier because we need to strengthen. We all agree on that. “We have been chosen again (to be) live on telly and the income for our club is massive. That allows us hopefully to do in January what is needed. We have recruitment meetings every week now. “To win at Hereford was for me first and foremost about pride but on the financial side it was a massive bonus. “The chairman is delighted but I am just happy for my players that we are heading into the Peterborough game on Sunday with momentum and good confidence. Peterborough also needed a replay to beat non-league opposition (Woking) ahead of a huge League One clash which could see Rosler’s men leapfrog the visitors with victory at Highbury. Rosler (above) said: “My whole focus is Peterborough. They have the advantage of two more recovery days than us. That is a big ask for us but we need to make sure we do everything right to give ourselves a chance to compete. 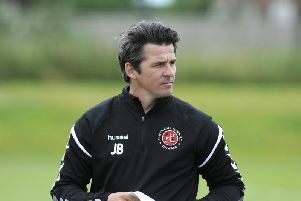 “It is very important that we are going into that game with Peterborough with good momentum. “That performance was confidence-building. We did not win it with luck – we were worthy winners. “We have a lot of young players who have a lot of ambitions and rightly so and Thursday was a great opportunity. A lot of people will know how difficult it is to get a result (there) and a lot of players used that opportunity. Rosler says midfielder Kyle Dempsey is “50-50” to return tomorrow, having gone off with concussion last weekend at Wigan and missed Thursday’s cup-tie.